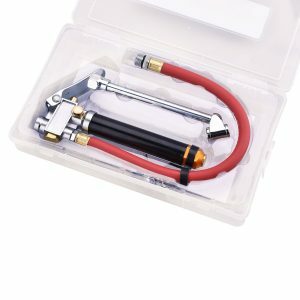 Wynnsky's Tire Inflator Gauge Kit is ideal for industrial, home, or shop use. It has zinc cast alloy body with heavy duty brass internal parts, 6-inch chrome plated dual head chuck also included in the package. 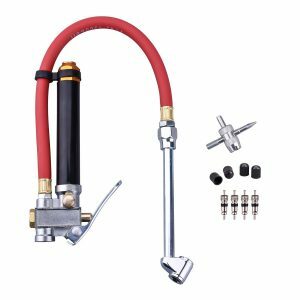 It also has an easy to read pressure gauge which measures 20PSI to 120PSI and has a 12-inch red heavy duty flexible air hose with a Standard 1/4 inch NPT female inlet. It provides you with easy and controlled inflation and comes with a year warranty. 1 Piece 4-way tool, 4 Piece Valve cores, 4 Piece Plastic caps are all included in the case as a gift for you. Believe our tire inflator gauge will serve you for a long time! © 2019 © 2017 Ningbo YUANDING IMP.&EXP.CO.,LTD.